A market correction in the fourth quarter, spurred by a number of global macroeconomic concerns and rising interest rates ended up having a negative impact on the markets and many hedge funds as a result. The stocks of smaller companies were especially hard hit during this time as investors fled to investments seen as being safer. This is evident in the fact that the Russell 2000 ETF underperformed the S&P 500 ETF by nearly 7 percentage points during the fourth quarter. We also received indications that hedge funds were trimming their positions amid the market volatility and uncertainty, and given their greater inclination towards smaller cap stocks than other investors, it follows that a stronger sell-off occurred in those stocks. Let’s study the hedge fund sentiment to see how those concerns affected their ownership of Vodafone Group Plc (NASDAQ:VOD) during the quarter. Hedge fund interest in Vodafone Group Plc (NASDAQ:VOD) shares was flat at the end of last quarter. This is usually a negative indicator. The level and the change in hedge fund popularity aren’t the only variables you need to analyze to decipher hedge funds’ perspectives. A stock may witness a boost in popularity but it may still be less popular than similarly priced stocks. That’s why at the end of this article we will examine companies such as Colgate-Palmolive Company (NYSE:CL), Intuit Inc. (NASDAQ:INTU), and EOG Resources Inc (NYSE:EOG) to gather more data points. Let’s view the recent hedge fund action surrounding Vodafone Group Plc (NASDAQ:VOD). How are hedge funds trading Vodafone Group Plc (NASDAQ:VOD)? 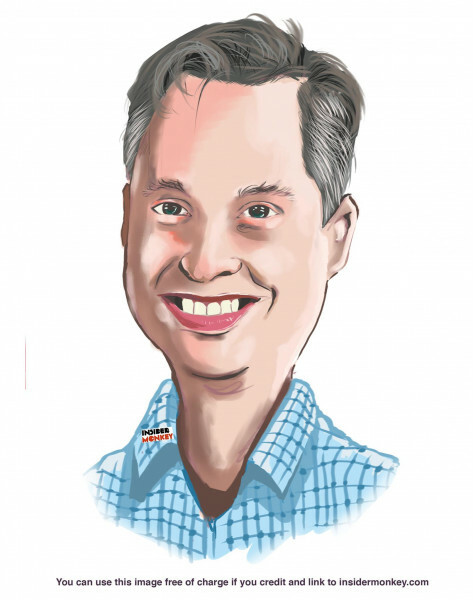 At the end of the fourth quarter, a total of 18 of the hedge funds tracked by Insider Monkey were bullish on this stock, a change of 0% from the second quarter of 2018. 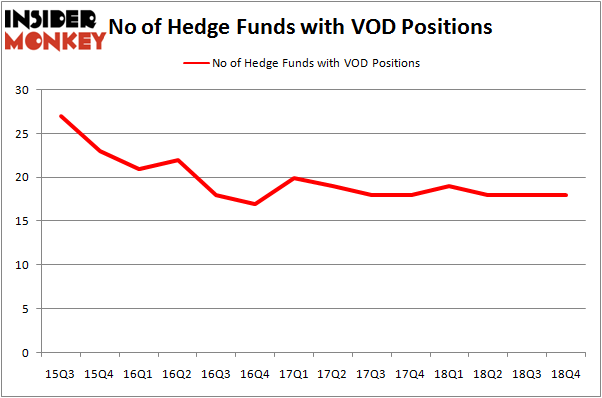 On the other hand, there were a total of 19 hedge funds with a bullish position in VOD a year ago. With hedge funds’ sentiment swirling, there exists a few key hedge fund managers who were adding to their holdings meaningfully (or already accumulated large positions). Among these funds, Renaissance Technologies held the most valuable stake in Vodafone Group Plc (NASDAQ:VOD), which was worth $294.6 million at the end of the third quarter. On the second spot was Arrowstreet Capital which amassed $243.6 million worth of shares. Moreover, D E Shaw, Two Sigma Advisors, and Millennium Management were also bullish on Vodafone Group Plc (NASDAQ:VOD), allocating a large percentage of their portfolios to this stock. Since Vodafone Group Plc (NASDAQ:VOD) has witnessed falling interest from hedge fund managers, we can see that there lies a certain “tier” of funds who sold off their full holdings last quarter. Interestingly, Sean Murphy’s Game Creek Capital said goodbye to the biggest stake of all the hedgies followed by Insider Monkey, totaling close to $8.1 million in stock. Paul Cantor, Joseph Weiss, and Will Wurm’s fund, Beech Hill Partners, also cut its stock, about $3.8 million worth. These moves are intriguing to say the least, as aggregate hedge fund interest stayed the same (this is a bearish signal in our experience). Let’s check out hedge fund activity in other stocks – not necessarily in the same industry as Vodafone Group Plc (NASDAQ:VOD) but similarly valued. These stocks are Colgate-Palmolive Company (NYSE:CL), Intuit Inc. (NASDAQ:INTU), EOG Resources Inc (NYSE:EOG), and Schlumberger Limited. (NYSE:SLB). This group of stocks’ market values resemble VOD’s market value. As you can see these stocks had an average of 43.25 hedge funds with bullish positions and the average amount invested in these stocks was $1523 million. That figure was $627 million in VOD’s case. Schlumberger Limited. (NYSE:SLB) is the most popular stock in this table. On the other hand EOG Resources Inc (NYSE:EOG) is the least popular one with only 37 bullish hedge fund positions. Compared to these stocks Vodafone Group Plc (NASDAQ:VOD) is even less popular than EOG. Hedge funds were clearly bearish about the prospects of VOD at the end of December. Our calculations showed that top 15 most popular stocks among hedge funds returned 19.7% through March 15th and outperformed the S&P 500 ETF (SPY) by 6.6 percentage points. Unfortunately VOD wasn’t in this group. Hedge funds that bet on VOD were disappointed as the stock returned 10.9% and underperformed the market. If you are interested in investing in large cap stocks, you should check out the top 15 hedge fund stocks as 13 of these outperformed the market. Itau Unibanco Holding SA (ITUB): Are Hedge Funds Right About This Stock? Were Hedge Funds Right About Buying United Technologies Corporation (UTX)? Hedge Funds Have Never Been This Bullish On Thermo Fisher Scientific Inc. (... Were Hedge Funds Right About Buying Costco Wholesale Corporation (COST)? Were Hedge Funds Right About Dumping Twenty-First Century Fox Inc (FOX)? Do Hedge Funds Love Diageo plc (DEO)?